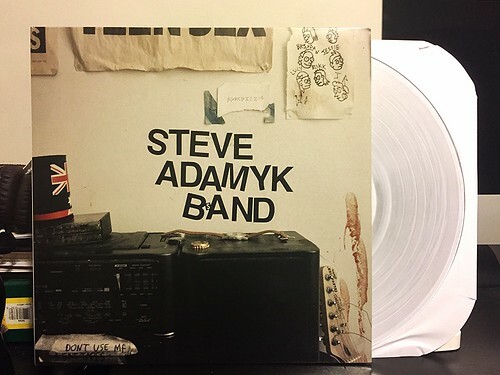 I have been such a gigantic fan of the Steve Adamyk Band since their very first 7" that came out on Ptrash so many moons ago. When I picked that record up based on a "this is a dude from Sedatives" descriptions, I really don't think I realized it would turn into the starting point of one of my favorite bands of the entire decade. Adamyk & company have kept up a furious pace of releasing records and Graceland is their fifth full length since 2010. I've never really had anything resembling actual complaints about anything that Steve Adamyk Band has ever released, but if I had to point to one hing, it was that I didn't completely love the recording/production of their last album Dial Tone. The songs were there and it was still one of my favorite records of that year, but the recording felt a little flat on some songs. Any issues with that have been completely resolved with Graceland. The production is bright, crisp and punchy. Graceland starts out with the speedy burst of frantic energy that is "Through My Fingers." It's a burner of an album opener that instantly grabs your attention, but from there the band takes things down half a notch with "Carry On." For me, this is always where Steve Adamyk band hits their sweet spot. Slightly slower than their fastest songs, the verse has the "whoas" in the right places and it builds into a supremely catchy hook. I just love stuff like this and it throws me back to my favorite Adamyk song from their first album "Your Only One." No one can touch Steve Adamyk Band when they're hitting songs like this. The rest of the album varies from excellent to stupidly good. Hit after hit with buzzsaw guitars, catchy vocals and even some tasteful synth here and there to give the album a little extra flavor. If you've been reading this website for any length of time, none of this should be news for you. I've been screaming at the top of my lungs about how much I love this band for years. What's really amazing to me is how they are just as incredible on their fifth album as they were the first time I heard them. Keep it up guys!